I've long been a huge fan of Thomas Perry's Jane Whitefield series. Jane is a contemporary Seneca Indian woman who lives in upstate New York. She's a "guide" who helps endangered people escape their current lives and settle into new ones. She often does this at great risk to herself since the villains chasing after the people that Jane is rescuing are most often very devious and extremely evil. A particular joy of the series is watching the ways in which Jane helps her clients disappear. Poison Flower is the seventh book in the series, which Perry began in 1995. He published a new Jane Whitefield novel annually until 1999. He then took a ten-year break before the sixth book appeared in 2009. As this book opens, Jane disables a police guard and breaks free James Shelby, a convicted murderer who has been brought back to court for a routine procedure. Shelby's sister has convinced Jane that he was wrongly convicted and Jane agrees to help him escape. Leaving the courthouse, though, Jane encounters five thugs who work for the man who framed Shelby. Shelby escapes and goes to the place where he and Jane have agreed to meet. Jane, though, is shot and captured by the bad guys who brutally torture her in an effort to force her to tell them where they can find Shelby. This is still very early in the book and through a clever ruse and utilizing her own skills as a warrior, Jane manages to escape and make her way to the rendezvous with Shelby. Along the way she picks up a battered woman from a shelter and the three of them then collect Shelby's sister who will obviously be a target of the vicious thugs. The bulk of the book consists of the efforts of Jane and the three people whose lives now depend on her to escape the bad guys so that Jane can settle the three safely into new lives. I found it hard to accept the idea that Jane would bust a convicted killer out of jail. All of Jane's previous "clients" have been genuinely sympathetic victims that the reader could immediately empathize with. In this case, Jane has no hard evidence that Shelby is actually innocent. She is apparently acting on her gut instincts that tell her that Shelby's sister is correct in insisting that he was framed for a murder he did not commit. It's one thing for Jane to rescue an abused wife and spirit her away from a sadistic violent husband. It seems quite another for her to substitute her own wisdom for that of the police, prosecutors, jurors and judge who convicted Shelby and thus break him free. This just seemed wrong to me and it clouded my whole experience of reading the book. I also couldn't figure out why the five thugs would show up for a routine court hearing. Certainly they have no way of knowing that Jane is about to break the guy out. Why are they there? We never learn. In the process of breaking Shelby free, Jane commits any number of serious crimes. The police as well as the thugs are in hot pursuit. The cops have Jane's description and her picture. Jane is concerned about avoiding the cops but apparently assumes that if she survives this ordeal she will be able to simply return to her "real" life as a New York housewife with no legal repercussions. This also apparently assumes that no one in her hometown is going to be watching the Great Escape play out on cable news and say, "Ohmigod--look! That's Jane from next door!" As another concern, Jane is now a married woman. 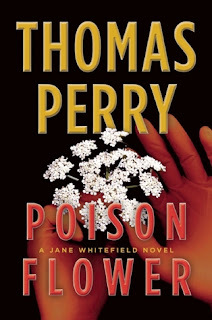 Perry has made no secret of the fact that he intended to end the series a couple of books ago, and as he prepared to do so, he married Jane to a handsome and very likeable doctor. At that point, Jane promised her new husband that she was retiring from her guide business and from that point on would be content as a wife and (she hoped) a mother. Her husband did not ask her to do this; she made the promise of her own volition. The promise, of course, was short-lived. Otherwise there would have been no new Jane Whitefield books. But Jane has now left home on several occasions, putting her life at great risk, communicating only rarely with her husband and leaving him lonely and worried sick, wondering if he will ever see her again. This seems unkind, unloving and somehow just wrong on Jane's part. It would be one thing if she were a cop or an FBI agent or some such thing where this was simply a part of her job. But, as her husband points out, Jane is a civilian under no obligation to help the people who keep showing up at her door. There are police and other agencies whose job it is to help these people, and the reader (at least this one) can't help but feel that her husband has a legitimate concern here. And this is not a gender issue. I would feel the same way about it if the protagonist were John Whitefield and he were leaving his wife in his wake like this. Jane's first adventure in the wake of her marriage came about in a fairly legitimate fashion after a bomb exploded at a hospital charity function. She could promise her husband that she had to go out on one last mission and both he and the reader could buy into the premise. But if Perry intended to keep sending her out like this, it might have been a better idea simply to have killed the husband in the explosion. This would have allowed Jane an added motive for getting involved in these matters again and would not leave the reader wondering how she could so easily inflict this kind of heartache on a person she loves. There's a good reason why super heroes generally do not have spouses or other permanent romantic entanglements and Jane would be better off without one. One final and fairly minor concern: Whenever Jane goes out on one of these missions she spends thousands of dollars buying cars, renting homes for long periods of time, paying for gas, meals, hotels and the like. Her clients are generally not in a position where they can pay for her services. Where does the money come from? The answer is that even after she married, Jane kept her old childhood home. In the basement there is a length of ductwork that contains an apparently endless supply of money and fake IDs. Whenever Jane is ready to go out on a mission, she simply stops by the house, picks up a few IDs and a big wad of cash, and she's good to go. There have been a couple of opportunities along the way for Jane to squirrel away some money, but after a while this starts to stretch credulity. You have to figure that sooner or later, Jane is going to open the magic ductwork and discover that she's down to her last fifty bucks. But it never seems to happen. This litany of concerns should not suggest that I didn't enjoy the book; I did. And I would certainly encourage any reader who hasn't already done so to find the series. But I would also strongly encourage them to begin with the first book, Vanishing Act, which introduces the character and which is also a great heart-pounding ride.